Alpha Fetoprotein (or AFP) is a fetal blood protein present abnormally in adults with some forms of cancer (as of the liver) and normally in the amniotic fluid of pregnant women but with very low levels tending to be associated with Down syndrome in the fetus and very high levels with neural tube defects (as spina bifida) in which the tube remains open. AFP is a major plasma protein produced by the yolk sac and the liver during fetal development. It is thought to be the fetal form of serum albumin. AFP binds to copper, nickel, fatty acids and bilirubin and is found in monomeric, dimeric and trimeric forms. The level of AFP is typically high in the fetus’s blood. It goes down in the baby’s blood after birth. And by a year of age, it is virtually undetectable. 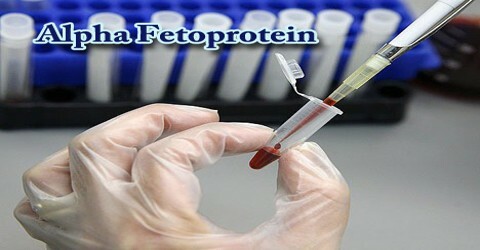 Alpha Fetoprotein (AFP) is classified as a member of the albuminoid gene superfamily consisting of albumin, AFP, vitamin D (Gc) protein, and alpha-albumin. Molecular variants of AFP have long been reported in the biomedical literature. Early studies identified isoelectric pH isoforms and lectin-binding variants of AFP, which differed in their physicochemical properties, but not in amino acid composition. Genetic variants of AFP, differing in mRNA kilobase length, were later extensively described in rodent models during fetal/perinatal stages, carcinogenesis, and organ regeneration. AFP is a glycoprotein of 591 amino acids and a carbohydrate moiety. 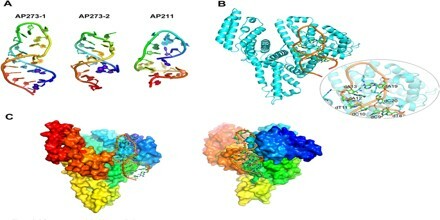 Various AFP-binding proteins and receptors were reported to inhibit certain AFP immunoreactions. Concomittantly, human and rodent AFP were cloned and the amino acid sequences of the translated proteins were divulged. Once the amino acid composition of the AFP molecule was known, enzymatic fragments could be identified and synthetic peptide segments synthesized. The function of AFP in adult humans is unknown; however, in rodents it binds estradiol to prevent the transport of this hormone across the placenta to the fetus. The main function of this is to prevent the virilization of female fetuses. As human AFP does not bind estrogen, its function in humans is less clear. The rodent AFP system can be overridden with massive injections of estrogen, which overwhelm the AFP system and will masculinize the fetus. The masculinizing effect of estrogens may seem counter-intuitive since estrogens are critical for the proper development of female secondary characteristics during puberty. The high affinity of AFP for estrogen could have important biological functions, although the significance of this binding has not yet been clearly defined. Elevated levels of AFP are seen in a variety of clinical situations, including pregnancy; hepatic disorders, especially chronic hepatitis; and various malignancies, particularly hepatomas, teratomas, and those of primitive gut origin. It is also produced in murine GVH reactions and in lymphomas, both in mice and humans. AFP could promote the development of tumors either by suppressing immune surveillance and/or immunity to oncogenic viruses, although this is speculative. 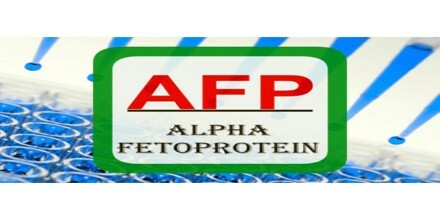 Alpha Fetoprotein (AFP) is a substance made in the liver of an unborn baby. AFP blood test checks the level of AFP in a pregnant woman’s blood. An AFP test can also be done as part of a screening test to find other chromosomal problems, such as Down syndrome or Edwards’s syndrome. An AFP test can help find an omphalocele, a congenital problem in which some of the baby’s intestines stick out through the belly wall. 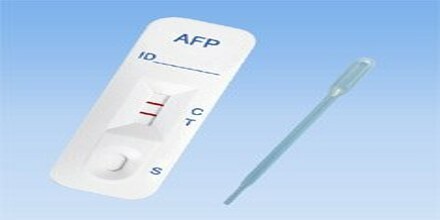 The level of AFP in the blood is used in a maternal serum triple or quadruple screening test. Generally done between 15 and 20 weeks, these tests check the levels of three or four substances in a pregnant woman’s blood. The triple screen checks alpha-fetoprotein (AFP), human chorionic gonadotropin (HCG), and a type of estrogen (unconjugated estriol, or uE3). The normal range of AFP for adults and children is variously reported as under 50, under 10, and under 5 ng/mL. 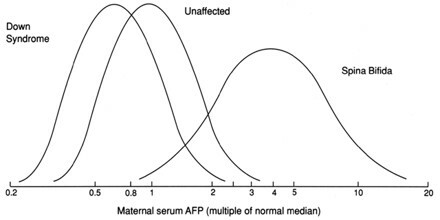 At birth, normal infants have AFP levels 4 or more orders of magnitude above this normal range, which decreases to a normal range over the first year of life. Patient may get a small bruise at the site. They can lower the chance of bruising by keeping pressure on the site for several minutes. Ongoing bleeding can be a problem for people with bleeding disorders. Aspirin, warfarin (Coumadin), and other blood-thinning medicines can make bleeding more likely. If they have bleeding or clotting problems, or if people take blood-thinning medicine, tell doctor before their blood sample is taken.